We're seeing significant interest in the Intapp user conference, Inception, scheduled for April 24-27. More details on the complete event and agenda at the conference web site. Risk Survey review – Over the past decade, Risk Roundtable industry surveys have provided unique insight into industry trends, priorities, challenges and response strategies. This session will unveil the 2016 report, and feature review and discussion of key findings by an expert panel, along with ample time for audience Q&A and discussion. Business Acceptance Maturity Model (BAMM) – The Business Acceptance Maturity Model (BAMM) allows firms to self-assess and rate their policies and procedures against overall industry practices and standards – which can vary based on jurisdiction and conflicts clearance models. This panel will review and share real-world examples of the four distinct acceptance approaches, and explore how you can use the BAMM framework to drive the change and improvement you want at your firm. 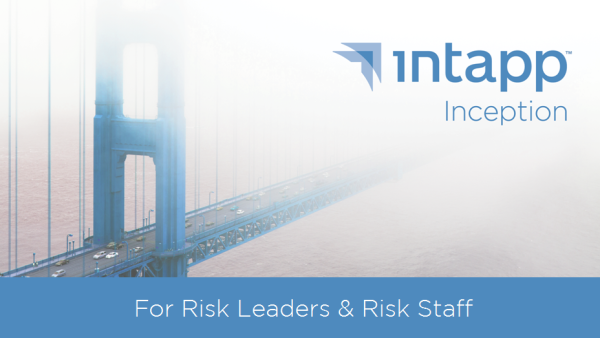 Risk Staffing Approaches: Conflicts & beyond – How is your firm’s risk team organized? Is risk organized under a single individual or umbrella group? Or is it distributed? Do conflicts managers and other risk staff wield broad authority to resolve issues? Or are they directed to follow layered escalation paths as issues arise? This panel discussion will explore different approaches for staffing the risk function, the various the pros and cons of each, and approaches for evolving your own organizational approach to best achieve your specific risk and business goals. Making the case for investing in risk – Whether it’s for new technology, new staff positions, or new policies and practices – it’s no secret that making the case for investing in risk management can be challenging. But it’s critical to the long term health and success of every firm, and a cause worth advocating for. This panel will explore different strategies and approaches leaders have pursued to win mindshare, budget and support for risk initiatives. What are the “slam dunk” scenarios? What are the best arguments to make? Where’s the best place to start? Come hear real-world stories and advice from your peers – and bring your own to share as well.